The Energy Saver is built using Heat Pump technology. Heat pumps move heat from one location to another. This is done using the state change and compression of a refrigerant from gas to liquid and back again utilising a well known physics formula called the Ideal Gas Law. This may sound a bit complex, so further down on this page we explain how this works in more detail and we also provide links to further reading. 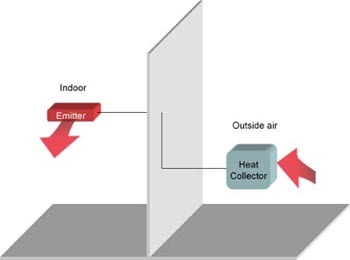 When used for heating heat pumps move heat from the outside in to the building. The source of the heat can be the ground, water or air. An air source heat pump (ASHP) uses the outside air, which is often easier, cheaper and more effective than the two other sources. This method of providing heat can be surprisingly effective, often providing three to four times as much heat compared to the electricity consumed in running the unit. The Energy Saver heat pump has been further enhanced and has been proven to deliver real life heat performance of 800% when compared to traditional heating systems. Heat pumps are in fact very common and every home has one as the refrigerator is a simple heat pump (heat is moved from the inside of the fridge and evaporated at the back). The first heat pump systems for domestic heating was built in the 1940s in America. The first mass market deployment was of ground source heat pumps (GSHP) in Sweden and the Nordic countries in the 1970s. Today there are about one million GSHPs installed around the world. In the late 1990s domestic householders in Sweden started to demand a cheaper solution than GSHP (£ 20,000 fitted), and suppliers started to fit split type reversible air source heatpumps, as these could be fitted for 15 to 20 % of the cost of a GSHP. These had been used primarily for cooling / air conditioning in warmer climates, but the more advanced ones could be reversed and provide heating instead. These became very popular and more than 800,000 have been fitted in Sweden alone, often saving owners well in excess of £ 1,000 per year and with a short pay back period of only a few years. Countries with similar climates i.e. the Nordics, Switzerland, Austria, Canada and the nothern parts of USA have also installed many thousands of these systems. United Kingdom has seen fewer systems deployed, but we have now installed several hundred systems since 2007, and with a very satisfied client base. There are a number of different suppliers and makes of air source heat pumps. Some are of course better than other. We performed extensive market analysis and research prior to starting EHS early in 2007, with particular focus on Sweden, as it is the leading market in adoption of heat pumps of all kinds. 1. Sweden has exentensive and detailed fault statistics collected since 1999, containing details about manufacturer and what component has gone wrong. Uniquely we are therefore able to offer solutions with the proven best quality. 2. The Swedish market air to air heat pumps have been substantially improved for heating. Those are the ones we sell here in the UK. An air source heat pump is an electrical device that extracts heat from one place and transfers it to another. The heat is transferred by circulating a substance called a refrigerant through a cycle of alternating condensation and evaporation. A compressor pumps the refrigerant between two heat exchanger coils, the condenser and the evaporator. In the outdoor condenser, the refrigerant is condensed at low pressure and absorbs heat from its surroundings. The refrigerant is then compressed on its way to the indoor unit evaporator, where it evaporates at high pressure. At this point, it releases the heat it absorbed earlier in the cycle. The refrigerant is then passed through an expansion valve where the pressure is lowered, and again passed through the condenser. Further reading at the Wikipedia web site here.